Have you already tried the spread with avocado? It is very convenient to prepare, and for the body it is a rich and very healthy and nutritious substance. This exotic fruit is available all over the markets, however, because its prices are usually high we do not even notice this delicious fruit. 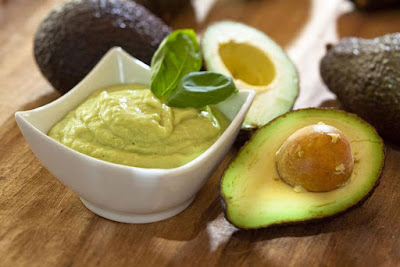 Avocado can prepared with various dishes, salads or with the famous guacamole sauce. Stay with us and find out how to use this very healthy fruit. For the spread of avocado recipes are numerous, by the way, they are very simple. Quick and easy and fill refresh your nutritious breakfast! Avocado spread is one of the most common forms in which we eat this fruit. The origin of the plant itself is from the jungle of tropical area of ​​South and North America. Its Latin name is Persea Americana (Persea Gratissima). There are two types, one is growing in Mexico and the other in western Indiana. The third variety is a hybrid of the two. It is an evergreen tree, of height of 20m, and the leaves are a large and dark green. The fruit shape is reminiscent of a pear, but is larger, has a nice, green and rough bark. The fleshy part of the plant is yellow in color, while in the middle there is a pit, which is very hard and round, it is a size of small nut. This unusual fruit was also called "alligator pear". Of course like most tropical fruits, avocados are also harvested while green. It ripens on the way to the desired destination. Before it arrives at the place where you buy it, it passes another selection process depending on how much the fruit is ripe. In diet raw fruit is used, which has virtually no taste if you eat it in itself. But the recipe for the spread of avocado is everywhere readily available, so with a little spice it gives a much better taste. The most commonly used is combined with vegetables or fruit in salads. It is used for preparing spreads and sauces, and the most famous is guacamole sauce. This fruit is very nutritious. Vitamin present in it are vitamin A, B6, B9 (folic acid), C, K and E. The wealth of minerals: calcium, iron, magnesium, phosphorus, potassium and copper, the contents of which are three times higher than in bananas. Then avocado contains proteins, plenty of fiber, a larger amount of vegetable fats and the good fats that are healthy. It is an excellent source of niacin, pantothenic acid, riboflavin, lutein, containing beta-carotene, beta-sitosterol and zeaxanthin. 100 grams of avocado has 160 calories, 15 g of fat, 9 g of carbohydrate and 2 g of protein. You can eat it as an avocados spread, or cut in half and sprinkled with herbal spices and maple syrup. Then it can be prepared as tasty dressing, mash it and add a little yogurt and spices. Mix well and pour over cooked rice, for example. Famous Guacamole spread is excellent with tortillas and chips. Avocado is used in the diet, but also in cosmetics when preparing masks for hair and face and various other preparations. Its leaves are used in the preparation of essential oil. Avocado oil is super useful for the regeneration and rejuvenation of the skin, due to the high concentration of essential fatty acids. They prevent drying of the skin and provide elasticity. What are the health benefits of this super fruit? Spread of avocado as well as fresh fruit has a low glycemic index. It is excellent in the prevention of insulin resistance that causes diabetes. For this reason, avocados are good in the prevention of diabetes. Avocado contains 18 different essential fatty acids, among other it has omega 3 healthy fats. They are good mainly for preserving heart health. Monounsaturated fatty acids have an impact on reducing the bad cholesterol. Avocado contains oleic and linoleic (mono- unsaturated fatty acid which makes the 59 percent of total fat in an avocado). Precisely those reduce bad cholesterol and increase the good one. Also this fat has an effect on the regulation of triglycerides in the blood. So it has an important role in reducing the risk of cardiovascular disease, hypertension, stroke, and atherosclerosis. Avocados are especially suitable for people who have problems with digestion or gastritis. Using these foods we increase the adoption of nutrients in the body. Because of the high fiber content it has a positive effect on our digestive organs and gives a feeling of satiety. Fibers regulate digestion, provide some sort of protection of the digestive organs and reduce the risk of diverticular disease and hemorrhoids. What additional benefits to our body can a healthy and nutritious breakfast as the spread of avocado have for our health? Due to the high content of potassium in avocados, it has positive effects on concentration, memory, as well as on the functioning of the whole central nervous system. It also has a beneficial effect on the muscles and reduces fatigue. Natural pigment lutein from the group of carotenoids, which is represented in this healthy food protects against certain cancers. Reduces the risk of developing macular degeneration of the eye and prevents cataracts. Avocado contains three times the pigment compared to any other type of fruit or vegetable. Due to the significant content of vitamin E it is an antioxidant, is good for the prevention of cancer and prevents inflammation of the intestine. Folic acid (vitamin B9) is involved in converting food into energy, it is important for liver, health of hair and skin. Then is essential for good brain function and proper development of the organism. It is particularly important in early childhood, because it promotes rapid cell growth, as well as development of babies during pregnancy. How is avocado spread made? First, slice the fruit in half and remove any seeds, and then remove the fleshy part with the spoon. Add lemon juice and make a paste, and then insert the other spices. It is best to eat it while fresh. Serve with bread and tomatoes. It is very convenient for breakfast, and is rich in nutrients. Additionally, according to your taste, you can insert a variety of other spices in avocados spread. It can be hot pepper, basil, onion, and sour cream. The most convenient way to unite the ingredients is in a blender. This quantity is sufficient for approximately 8 smaller fragments of integral or corn bread. In addition to serving another 100 g of cherry tomatoes. It is very easy meal so it can be included in the menu for dinner without any hesitation. If you are using chrono diet, this recipe will be a big hit for you. One avocado, hot red peppers, a small tomato, small onion and a small clove of garlic. Then another feta cheese about 50 to 60 grams, half a lemon juice and a little salt. All unite in a blender and that's all - so it's easy. You will receive an exceptional spread of avocado. It's done in a jiffy. You will benefit those who adhere to this diet. The best results you will achieve if you use this food as healthy morning meal – it is perfect for breakfast in chrono diet. Users of chrono diet will rejoice at yet another great recipe. It is necessary in a blender to grind the ingredients and then cool the mixture. Use together with toasted bread and a small tomato and you will not go wrong. For the spread of avocado recipes vary. Here we bring you such combinations. It is a nutritious and healthy snack! You can be sure of that. lemon juice in particular grated rind. Onion, celery and pepper chop and mix with mashed avocado and tuna. And you can combine all the ingredients by mixing them in a blender. As you prefer. If you like tomatoes, here is another way of preparation. The ingredients are: one can of tuna, half an avocado, one tomato, and fresh pepper. You would need a little lemon juice, tablespoon of olive oil, pepper, cayenne pepper, if desired, and salt. Add a little basil or parsley leaf. salt, pepper and chili to taste. Mix everything in a blender and your avocado spread is ready for use. Who prefers to eat cream cheese, here is a recipe for it. Fresh mint, teaspoon of lemon juice, one or two tablespoons of olive oil, a pinch of salt and pepper. First, mash avocado with a fork in the puree. Then add the remaining ingredients and mix into a homogenous mass. Spread goes great with crackers or toasted bread for an appetizer. The spread made from avocado is not the only thing you can make from this super fruit. Here is something tasty that it can be easily prepared. 1st way: One ripe avocado, 2 tablespoons of lemon juice and olive oil, salt. You can add pepper, parsley, garlic, or something else. Put in blender and mix everything together. Enjoy your meal. 2nd way: More mature avocado, tomato and peel the bark, one fresh hot pepper, and small onion. You need one squeezed lime, a teaspoon of coriander seeds and a little fresh coriander leaves, salt and pepper. Put everything in a blender and mix it. 1-2 pieces of avocado, peel it and chop it and put in a blender, add the juice of half a lemon, a teaspoon of mustard and salt. Mix well and keep in the refrigerator for a maximum of one week. Cut into cubes one ripe avocado, one yellow and red bell pepper. Into rings, cut onions and you need a clove or two of garlic, olive oil, pepper and salt. Mix ingredients and season the salad. You can add other things if you desire. Parmesan grate at the end. Cook pasta, and mix other ingredients in a blender and make a fine dressing. Mix pasta and sauce. Cut avocados in half and remove the pit, make a little hole in the middle and put the egg. Bake in oven for 15 minutes at 200 degrees. If you are willing to include this food in your diet, you do not have to eat it only as a spread. The combination of spread with other foods provides new meals with great taste. The path to a healthy diet is not so boring. For avocado spread we use the basic recipe. One ripe avocado, clean and mash with a fork. Clove of garlic, tablespoon of olive oil, 1 teaspoon lemon juice, pepper and salt. Put all ingredients in a blender and make a puree. This spread can be kept in the fridge can last for two to three days. Toasted bread can be a great breakfast with this combination. Chop onions, eggs and capers, and mix with the other ingredients. Apply on bread and sprinkle with fresh dill. For example sandwich combination with parmesan and pepper is not at all bad. Apply spread on the bread and sprinkle with grated Parmesan cheese. From the top cover with rings of red pepper and lettuce. Two interesting salads that go excellent with the avocado spread. One salad includes cabbage, purple cabbage, beets, lettuce and carrots. All the vegetables cut into strips. For the dressing, mix one tablespoon of spread, sesame oil and a teaspoon of soy sauce. In the end, only mix the vegetables and dressing. Another proposal is a vegetable salad, according to your own taste. Mix 2 tablespoons of avocado spread with 100 ml of yoghurt and pour over the salad. It goes lovely with smoked salmon, which is put on toasted bread. You can use it as a sauce for fish or grilled vegetables from the oven. Who should not eat avocado spread? It is not good to exaggerate with this recipe, no matter how healthy it is. Especially since avocado spread is caloric, we must pay attention to the amount we use that would not lead to obesity. Of course, do not eat it if you are allergic to avocado or to a substances it contains. If you use medication for blood clotting, bypass this food. Some studies have shown that it reduces the effect of such drugs. For avocado spread recipes are numerous, and differences between them are very small. The most important thing is buying fresh fruits and we will share some tips about it. It is best to use avocados when they have mat color, without black spots on it. If you buy it while it is still green keep it wrapped in newspaper at room temperature until they ripen. For easier cleaning after cutting it in half, separating it from seeds, twisting it like when you unscrew the cap from the bottle. To release the second half insert a blade (intersects pit) and turn it the same movements in reverse direction. In this way you will not have to scarify this fruit with fingers. Where to buy avocado spread? Buying avocado spread is difficult to find in local stores. However, like fresh fruit you have it virtually in all well stocked supermarkets. It is available in bio shops. The average price of avocados is between 6 and 8 dollars per kilogram. You can if you are lucky catch it on discounts. Read our earlier text about the benefits of avocado to our general health. If you believe that this texts was useful, share it via social networks.